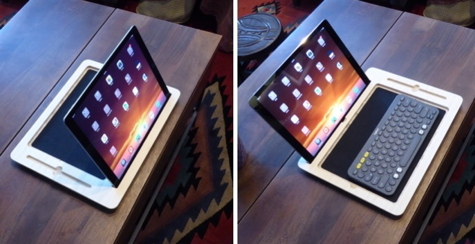 iSkelter has just introduced a lapdesk for the new iPad Pro that performs like a tray. Take a dinner plate to the living room sofa and you have to be careful since balancing it is risky. Put that plate on a tray and you immediately feel more secure and comfortable. No question about it, the iPad Pro is big. It’s also thin and slippery. The Canvas Smart Desk is designed to contain the Pro and make it more secure and useful in many situations. There is a felt-lined recess that exactly fits the iPad Pro lying flat and a slot at the edge that will hold the iPad Pro standing up. This slot should even work with a thin case. You can face the tray either way depending on your tasks — viewing or typing. If you prefer using an external keyboard, as I do (Logitech K380), it rests neatly in the felt-lined recess. Alternatively, the slot at the top can hold your iPhone if you are a compulsive multi-tasker. At the side of the tray is a slot with convenient thumb notches for the Apple Pencil. 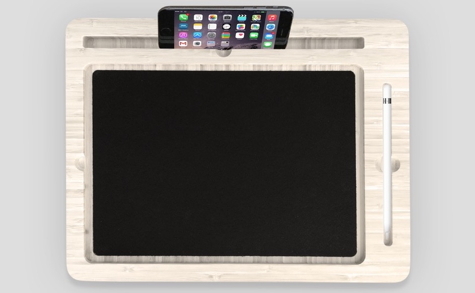 If you draw, paint, or do other graphic and photography projects on your iPad Pro, this lapdesk is made for you. If you spend much of your time writing, the stand configuration with a keyboard in the tray will provide laptop-like convenience. Due to its size, the iPad Pro is not designed to be as mobile as Apple’s other iPads. The Pro is better at a desk, coffee table, or on your lap. The iSkelter Canvas Smart Desk is perfect for these uses. The name Canvas confused me at first. iSkelter is well-known for their attractive laminated bamboo construction. I now believe the product name is to evoke an artist’s canvas as in painting or drawing. 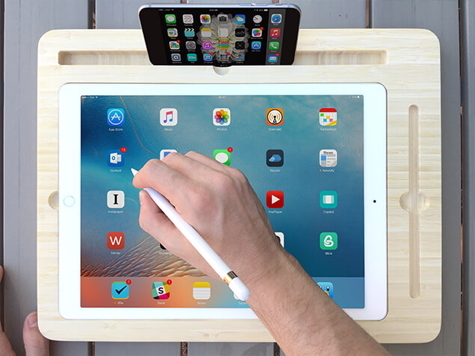 This tray isn’t for everybody since it increases the size of the iPad Pro even further. If you work at home or in an office and your iPad stays mostly in one location, this is an excellent solution. If you are mobile and travel frequently, it won’t be as convenient as you’ll have more to lug around. The lapdesk is 14.75 inches (38CM) by 11.5 inches (30CM). It is three-quarters of an inch (1.9) thick and weighs just under two pounds (0.91Kg). It is made in Phoenix, Arizona from the same laminated bamboo as rest of the iSkelter collection. The workmanship is first-rate and the finishing shows care. iSkelter states, “Hand-built by people who give a damn.” The quality of this product clearly demonstrates that care. A lapdesk for an iPad Pro? Yes indeed. You’ll be surprised at how handy it is. MyMac Rating is 9 out of 10.